SHEDDERS has now been published! Click here to see it on Amazon. Please post a review . After the initial publication of my book Shedders on this blog, readers asked for follow-up stories about day-to-day life in our little community. This blog captures some of our adventures and misadventures. 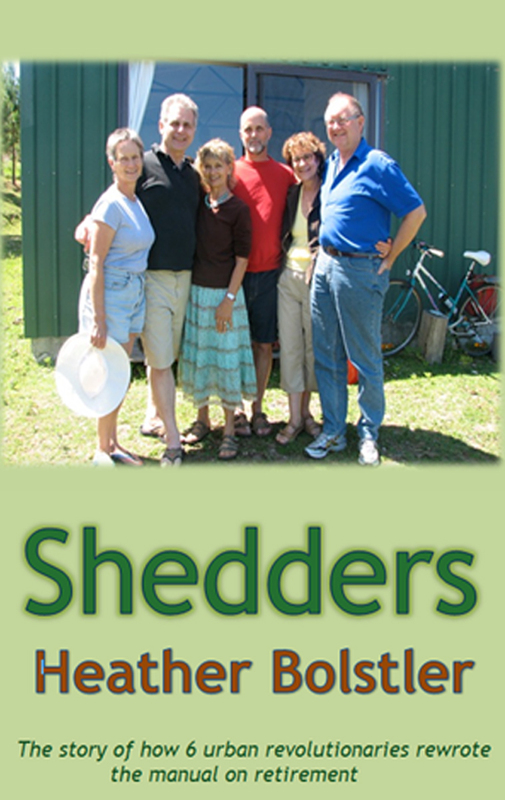 I have written a book, Shedders, a true account of how a group of six friends confronted the process of growing old. In the process, we created a vision of living together in a small community of trusted friends. Whatever made us think for a moment that we could carry it off? Shedders is the story of how we aligned our vision, searched for and found a location and came to grips with the money. We got to know each other – and ourselves – far better at times than we ever wanted. We dealt with the failure of the universe to serve us up exactly what we wanted. We handled our cold feet and hot tempers. We learned to shape and re-shape the vision. Finally, against all odds, in 2009 we moved into a fabulous home we had designed and built on a four-acre block in a truly beautiful part of the world. Sample the book by clicking on the Shedders: the book tab. Check out the About Shedders and me tab to find out more. ...by clicking on Faces and Spaces on my Blogroll below.